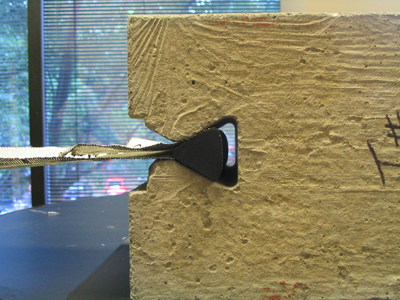 The patented Delta Connection™ System securely connects the geosynthetic reinforcement to the retaining wall or segmental wall facing units. When the reinforcement is under load the connectors obtains highly efficient, positive, mechanical, end-bearing connections exceeding 90 percent of the reinforcement’s ultimate tensile strength. Delta Connection System mobilizes its peak loads at small displacement. 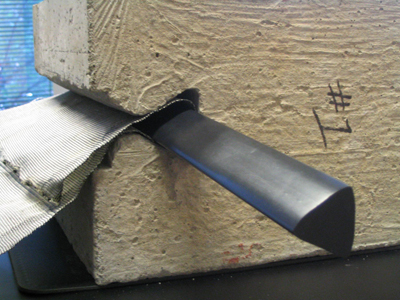 Additionally, the Delta Connection System is the only reinforcement to segmental retaining wall connection method that does not depend on overburden pressure for its connection strength and structural integrity. Our Delta Connection System is imperveous to differential settlement, vibrations and seismic loading.